Mid-way through the long reign of Queen Victoria, when the office of Prime Minister alternated between Gladstone and Disraeli. a small group of people, already working and living in the Enfield Wash area, united to form the Totteridge Road Baptist Church. Through the help of C.H. 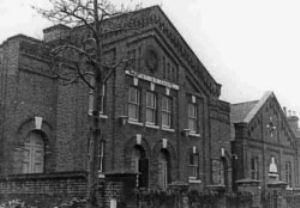 Spurgeon, they were able to purchase the piece of land in Totteridge Road, at the rear of which they erected a hall which was opened in October 1868. The first Church Meeting, held on January 15th, 1869, with eight people present. In 1870, the Sunday School was started, growing to over 200 strong before 1890. In 1871, the present day chapel building was completed. From its earliest days, the Church has belonged to the Baptist Union and the London Baptist Association. During the pastorship of Revd. Thorn 1887 to 1894, the land adjoining the chapel was purchased and the Lecture Hall was erected. In 1895, the Revd. Archibald Welch became the Pastor and remained so until 1925. During this period, a number of activities were established. These included the Women’s Bible Class, the Ladies’ Sewing Meeting, and the Christian Endeavour Society along with the Young People’s Midsummer Breakfast. In 1904, a Mission was held during which it was hoped to see two hundred coming to faith. In this and other ways, the Church exerted a considerable influence in the neighbourhood, social concern being expressed through a District Nurse, Sister May, retained by the Church. A soup kitchen was operated in periods of distress. In 1906, the Boys’ Brigade was introduced to the Church, with the Girls’ Brigade following in 1911. The First World War began in 1914, changing life in this country for ever. In this Church, as in every other, the casualty list significant, as the Memorial by the pulpit steps testifies. 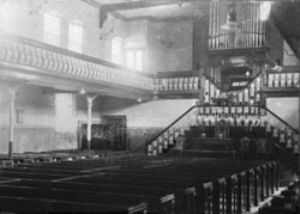 During Rev’d Welch’s ministry, the Free Church life in this country passed through its peak years and the chapel was enlarged by adding a gallery to accommodate six hundred worshippers. Revd. 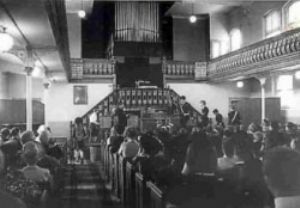 Jones’ was minister between 1927 and 1949, and during his time the accommodation for the Sunday School and the Young People’s Fellowship was greatly improved when in 1933, the original chapel building was replaced by a double-storey hall. For Totteridge Road, the years between the wars were years of activity and growth. At the outset of the Second World War, many of our members enlisted in the Forces and skies overhead were often filled with enemy planes, but only one member of the fellowship was killed — when a flying bomb fell on a local school. But the War had a detrimental effect upon the Church - particularly upon the Sunday School, because of the evacuation of many children. 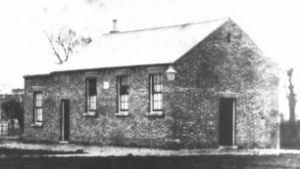 Prior to 1939, the Sunday School had over 350 children attending. Many, and in some cases whole families, left the area, some never to return. Mr. & Mrs. Jones remained here during the war and many in the church and neighbourhood felt the warmth of their friendship in those sad days. The Revd. James Walker came to the Church in 1951, but sadly ill health meant that his ministry lasted less than a year. The Revd. T. Alec Steen was our minister from 1952 to 1963, and during this time, further modifications were made to the Church buildings, including major improvements to the central heating system and porch. The out-reach work of the Church also expanded at this time. The Women’s Own meeting was started, and in 1952, the Sunday School was extended to include classes at the near-by Prince of Wales’ School. Also, from 1958 to 1961, members from Totteridge Road assisted the fellowship at Waltham Cross Baptist Church. The Rev’d. Peter Wortley was the minister from 1965 to 1975, during which time the Church celebrated its centenary, including a special church meeting held on Wednesday, 15th January 1969 — exactly one hundred years after the Church’s first meeting. This was held in the Primary Hall - the site of the original Chapel. The work of the Church went forward under his wise and kind guidance with spiritual renewal at the heart of church life. The Church joined with other local Churches in study groups, joined the Enfield District Council of Churches and started its association with Christian Aid.